Reconstruction of the ear can be a complex process. The 3-dimensional nature of the ear with its many curves, peaks, and valleys demand the utmost attention to detail. Yet, as challenging as it may seem, reconstruction of the ear can be made easier and predictable if one understands the surgical principles and anatomy. The techniques discussed in this article address defects that result from skin cancer excision. More than 1 million cases of basal cell carcinoma, squamous cell carcinoma, and malignant melanoma occur per year in the United States. A significant portion of these malignancies arise on the ear because of its exposure to the sun. All areas of the external ear are at risk for skin cancer, especially the helix and antihelix areas of the ear. Compared with other cancers, these tend to be more aggressive with higher recurrence rates. Given this setting, the defects on the ear can be relatively large. 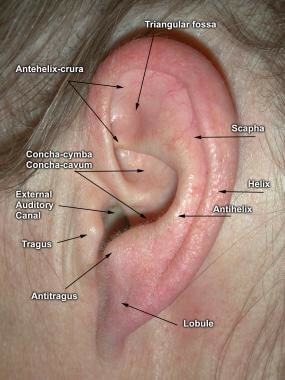 Surface anatomy of the anterior (lateral) surface of the ear. Posterior (medial) surface of the ear. The skin is less adherent than that of the anterior surface. The auriculotemporal nerve, a branch of cranial nerve V3 innervates the superior aspect of the anterior surface of the ear. The lesser occipital nerve and the great auricular nerve are both derived from C2 and C3. The lesser occipital nerve innervates the superior aspect of the posterior surface. The great auricular nerve innervates the lower portion of both surfaces. The vagus nerve supplies the concha. 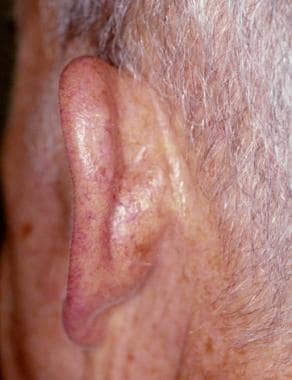 The ear is well vascularized, an important feature because most flaps are based on a random blood supply. The superficial temporal artery and the posterior auricular artery are branches of the external carotid artery and supply the anterior and posterior surfaces, respectively. Because of the rich blood supply and collateralization, anesthetics that contain epinephrine can be used safely. Reconstruction of the ear has relatively few contraindications. If the patient can tolerate the initial Mohs micrographic surgery, they can usually tolerate the subsequent reconstruction as well, although the complexity of the reconstruction may need to be tailored to the patient's medical state. In patients whose medical condition precludes surgery, other treatment options, such as superficial radiation therapy (SRT), should be considered. The patient's medical history should be assessed prior to surgery. Aspirin and warfarin increase the risk of intraoperative and postoperative bleeding complications. The use of these medications is not an absolute contraindication for skin surgery, but stopping these treatments prior to surgery is ideal, if possible. It is best to consult with the patient's cardiologist or managing physician before stopping any anticoagulants. Katzbach R, Frenzel H, Klaiber S, et al. Borderline indications for ear reconstruction. Ann Plast Surg. 2006 Dec. 57(6):626-30. [Medline]. Sajic D, Archibald J, Murray C. Surface anatomy of the ear. J Cutan Med Surg. 2014 Mar-Apr. 18(2):137-40. [Medline]. Tolleth H. Artistic anatomy, dimensions, and proportions of the external ear. Clin Plast Surg. 1978 Jul. 5(3):337-45. [Medline]. Salasche SJ, Bernstein G, Senkarik M. Surgical Anatomy of the Skin. Norwalk, Conn: Appleton & Lange. 1988:217-21. Brodland DG. Advanced reconstruction of the ear: a framework for successful wound closure. Dermatol Surg. 2014 Sep. 40 Suppl 9:S71-85. [Medline]. Brent B. The acquired auricular deformity. A systematic approach to its analysis and reconstruction. Plast Reconstr Surg. 1977 Apr. 59(4):475-85. [Medline]. Quatela V, Cheney M. Reconstruction of the auricle. In: Baker SR, Swanson NA, eds. Local Flaps in Facial Reconstruction. St. Louis: Mosby-Year Book. 1995:443-79. Antia NH, Buch VI. Chondrocutaneous advancement flap for the marginal defect of the ear. Plast Reconstr Surg. 1967 May. 39(5):472-7. [Medline]. Brent B. Reconstruction of the ear. Aston SJ, Beasley RW, Thorne CH, eds. Grabb and Smith's Plastic Surgery. 5th ed. Philadelphia: Lippincott-Raven; 1997. 413-29. Crikelair GF. A method of partial ear reconstruction for avulsion of the upper portion of the ear. Plast Reconstr Surg (1946). 1956 Jun. 17(6):438-43. [Medline]. Lawson VG. Reconstruction of the pinna using pre-auricular flaps. J Otolaryngol. 1984 Jun. 13(3):191-3. [Medline]. Santiago F, Serra D, Vieira R, Figueiredo A. Postauricular pull-through transpositional flap: an option for one-stage reconstruction of anterior auricle defects. J Dermatolog Treat. 2010 Sep. 21(5):294-7. [Medline]. D'Arpa S, Cordova A, Moschella F. Further application of the bilobed flap: the split bilobed flap for reconstruction of composite posterior auricular and mastoid defects. J Plast Reconstr Aesthet Surg. 2006. 59(12):1330-5. [Medline]. Vergilis-Kalner IJ, Goldberg LH. Bilobed flap for reconstruction of defects of the helical rim and posterior ear. Dermatol Online J. 2010 Oct 15. 16(10):9. [Medline]. Wines N, Ryman W, Matulich J, Wines M. Retrospective review of reconstructive methods of conchal bowl defects following mohs micrographic surgery. Dermatol Surg. 2001 May. 27(5):471-4. [Medline]. Kato H, Watanabe S, Nakamura M, Ijichi K, Morita A. Reconstruction of the external auditory canal using the random flap technique and laser Doppler evaluation. Dermatol Surg. 2014 Jul. 40(7):739-42. [Medline]. Left image: Small defects on the helix can be closed with primary linear closures as long as the width of the defect is within the helix. Note the narrowing of the helix, which may not be ideal in certain locations. Right image: The incision may have to be lengthened to blend the narrowing of the helix. Wedge excision repair. Panel A: Defect after cancer excision. Panel B: Wedge-shaped defect is created. Panel C: The helix is approximated. Panel D: Image shows the result immediately after surgery. If the defect is large, Burrow triangles can be superiorly and inferiorly excised to create a star. Chondrocutaneous advancement flap. Panel A: A 2.5-cm defect is present on the helix. Panel B: Another view of the defect. Panel C: Undermining and lifting of the posterior skin off the perichondrium. Panel D: Immediate postoperative view. Chondrocutaneous advancement flap. Panel E: Immediate postoperative view. Panel F: Anterior surface at 2 months after surgery. Panel G: Posterior surface at 2 months after surgery. Banner transposition flap. Panel A: The preauricular skin is used as the donor site of the flap. Panel B: The flap is lifted and draped into the defect. Panels C and D: Immediate postoperative views. Bilobed transposition flap. Panels A and B: A 2-cm defect on the superior helix. Panel C: Outline of the classic bilobed flap with 90° between the pedicles. Panel D: The flap is cut with a modified bilobed flap with a relatively small turning radius. Bilobed transposition flap. Panels E and F: Immediate postoperative views. Panel G: Anterior surface at 1 month after surgery. O-to-T advancement flap. Panel A: Defect with incisions lines marked. Panel B: Immediate postoperative view. Panel C: Immediate postoperative view of the anterior surface. Panel D: Posterior surface at 1 month after surgery. O-to-T advancement flap. Anterior surface 1 month after surgery. Skin graft. Panel A: Conchal defect with the cartilage removed. Panel B: Split-thickness skin graft in place. Panel C: Split-thickness skin graft at 1-month follow-up. Second intention healing. Panel A: Postoperative defect with exposed cartilage. Panel B: Holes punched through the cartilage expose the undersurface of the posterior skin. Second intention healing. Wound healing by second intention at 1-month follow-up. Preauricular advancement. Panel A: Defect on the helical root, the tragus, and the preauricular sulcus. Panel B: Cheek advancement into the face-lift line. Postauricular sulcus defect. Panel A: Large defect straddling the postauricular defect. Panel B: The defect is reapproximated with a single layer of modified vertical mattress sutures. Panel C: Posterior surface at 1 month after surgery. Postauricular sulcus defect in the same patient as in Image 17. Panel D: Anterior surface at 1 month after surgery. Panel E: Symmetry, as depicted in the posterior view at 1 month after surgery. Panel F: Symmetry, as depicted in the anterior view at 1 month after surgery. Modified vertical mattress sutures. Panel A: The needle is passed through fascia at the base of the sulcus. Panel B: Completion of one vertical mattress suture. Panel C: The sutures are tied after all of them are in place. Panel A: Defect on the lobule. Panel B: Primary closure of lobule defect with full-thickness wedge excision.